I'm composing this entry via Flickr to see how well it works. I don't know what it will look like but if it comes out OK then it will be a good way to blog. The picture above is just a shot to compliment two things - equipment and subject. I took this with the D300 and a SB600 fired remotely using the very effective Cactus V2s. My knowledge of cameras, exposure and photoshop is limited, but my knowledge of using flash is zero. So this is an experiment/playing around shot to see if I could light up the gable wall and still get a decent exposure on this poorly lit ruin. I have much to learn and much money to spend on more flashes! Can't wait. The other purpose of this shot is to consider what exactly am I going to take photographs of? I recently read a book called 'On Being a Photographer': David Hurn (Magnum) in conversation with Bill Jay. I enjoyed the book greatly but wondered if his point about you can only take really good shots of things you are passionate about was strictly true. He suggests you consider your passions, consider which of them you could conveniently photograph, (and photograph regularly) be pleasing to the eye and of interest to the viewer. It sounded like good advice but not so easy to achieve. 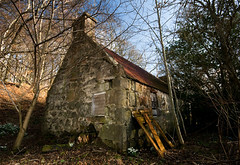 At present I have an interest in the many abandoned cottages, houses, farms and glens that litter the North East of Scotland, so I've been pursuing that and the results can be seen on Flickr. I also love where I live, so that is being photographed. I'm getting back into local history as well so I can see a project there. Now whether or not I'm being specific enough, I'm not sure. If any photographer reads this I would be interested in their views. As regards Flickr, well that can be a pain and a pleasure. More on that another time. One way to improve your photography? Camera Clubs - thoughts on them? Flickr lows and Life highs.